This weekend will be a full immersion into the Daoist arts of qigong, meditation, Daoist philosophy, and tea ceremony. Drawing on Solala’s 28 years of study of the Daoist arts we will delve into the ancient Daoist text the Dao De Jing, revealing the many practices that contained therein. We be diving deeply into Daoist meditation as well as learning a little dao-in or Daoist yoga. We will also be spending some time with Daoist tea Ceremony (pin ming lun dao). We will be sampling some special teas and taking part in a ceremony designed to open your heart and hara. By tuning into the sacred plant medicine we will experience an opening to higher spiritual and psychic planes. The qigong practice we will learning is an ancient cosmological form of qigong, Wuji (Primordial) Qigong, which was created by Zhang San Feng, a Daoist master and legendary originator of Taijiquan, (Tai Chi) 800 years ago, in the Wudang Mountains. This ancient magical Daoist qigong form combines circular movement, breathing and visualization, stimulating the flow of qi (vital force) for health, longevity and spiritual opening. By working with the primal energies of the five directions and the qualities of each — (East: The Green Dragon, South: The Red Phoenix, West: The White Tiger, North: The Black Turtle and Center: The Yellow Dragon) — the practitioner is performing an energetic ritual that has been done for hundreds of years. The movements, done in a circling pattern, guide us into a powerful and primordial state of grace and healing. Friday Night: Introduction to Daoist philosophy utilizing Solala’s interpretation of the Dao De Jing (Tao Te Ching) as well as Zhuangzi (Chuang Tzu). Healing meditation and some gentle qigong. Saturday: Morning meditation, dao-in (Daoist yoga) and Wuji (Primordial) Qigong. After Lunch: Daoist Gongfu Tea Ceremony (pin ming lun dao). Wuji Qigong practice. Saturday evening: Lecture, healing meditation, stories from the Daoist tradition. Sunday morning: Moving meditation, Wuji Qigong. Solala has been teaching qigong for 28 years. He has been the publisher of The Empty Vessel: The Journal of Daoist Philosophy and Practice, since 1993. He has had 12 books on the Daoist arts published and has recorded four cd’s of meditation/qigong music. 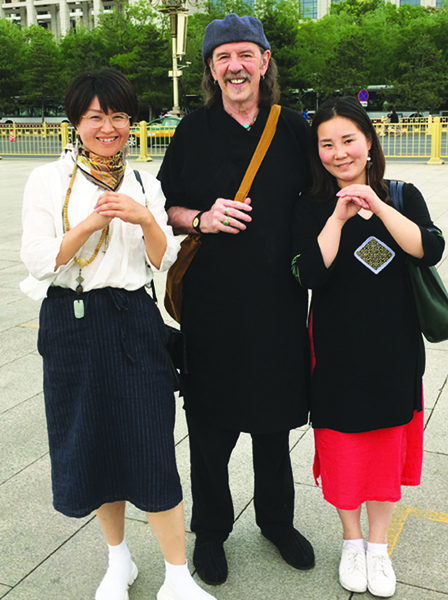 He is past president and founding board member of the National Qigong Association and leads tours to China to study qigong and meditation with Daoist teachers in the sacred Wudang Mountains. I felt the workshop did more than meet my expectations – it took me places I’ve never been and more importantly, it opened an access or light on my path that I knew existed but until now had not had the courage to pursue. Thank you for the gift. As a beginner I had almost no “expectations”. Even Friday evening, I knew this would be a very positive experience. Many thoughts dove-tailed nicely with present perspectives and others opened up new paths. Solala proved to be wonderful teacher, making learning for a newcomer such as myself enjoyable, pleasant, and beneficial! Excellent seminar. Perfect way to spend a hectic weekend. Nice touch explaining in layman’s terms oriental traditional medicine etc and how it effects qigong. Loved the readings and the meditations. The wuji form has been and continues to be a very profound teacher for me. I’ve been practicing the form before bed almost daily since I took your class—not out of a sense of discipline but out of love. The form does something for me that is very powerful.